In 1988 Mark Aylwin Thomas was invited by the Chinese People’s Association for Friendship with Foreign Countries (CPAFFC, 中国人民对外友好协会) to attend a series of memorial events in Beijing, Lanxhou and Shandan in commemoration of the New Zealander, Rewi Alley, who had died aged 90 in December the previous year after living and working in China for 60 years. While attending the week-long memorial events, Mark Aylwin Thomas became deeply impressed and moved by the extent to which the memory of his namesake uncle, George Aylwin Hogg, was so warmly and honourably expressed throughout the many speeches made that week. Rewi Alley had been a colleague of Hogg who had died in 1945 at the tragically early age of only thirty after dedicating his life to the development of the Chinese Industrial Cooperatives (CIC), particularly in the aspects of publicity and education. It became clear to Mark that these important memorial events were honouring the lives of both men, two remarkable people who were close colleagues in China during the war-time period prior to Liberation. During the long train journey from Lanzhou to Shandan, Mark was asked if he would be prepared to act the role of his uncle in a proposed dramatized documentary mini-series to be produced for television. At the same time Rewi Alley’s nephew, David Somerset, was asked if he would play the part of his uncle. Consequently, both nephews returned to China in the autumn of 1988 for three months of filming. Mark was encouraged in the role of his uncle by his aunt Rosemary, George Hogg’s sister, by her assurance that Mark was very much like his uncle, her beloved younger brother, in many ways. “Just be yourself!” she told him. George Aylwin Hogg’s sister, Rosemary, passed to the budding author all of her brother’s papers, letters and manuscripts for safekeeping and research for his book about his uncle. Mark Aylwin Thomas was born in 1946, approximately six months after the tragically early death of his uncle George Aylwin Hogg: the subject of Thomas’s book Blades of Grass. Thomas was born and raised in Sheffield, England, the youngest of a family of five children. 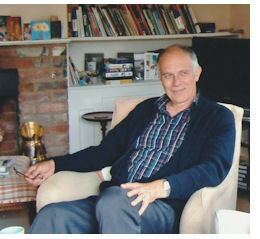 Father, Donald Thomas, was a renowned industrial educationalist. Mother, Barbara who was Hogg’s eldest sister, was prior to her marriage a teacher of Dalcroze-Eurythmics on both sides of the Atlantic. Mark’s unusual middle name, Aylwin, which he shares with his uncle, is of ancient Celtic origin meaning “wise friend” or “noble friend”. It was by this name that his uncle was always known within the family. Mark was given this name in honour of the memory of his much loved and recently deceased uncle. After sitting his GCE “O” and “A”-level examinations at Abbotsholme School in Staffordshire, Mark took a gap year travelling in the United States and Canada, spending a large part of his time there in Alaska. He went on to take a degree in printing technology at West Herts College, Watford and worked in the printing industry in Derby in sales and production administration until 1974 when he moved to Finland with his Finnish wife, Helena. Living in the midst of lakes and forests, near the town of Suonenjoki, Mark set to making a life as a farmer – dairy, beef, strawberries, and forestry – while his wife carved a career in adult education as a teacher of English as a foreign language. As a sideline Mark provided a translation and copy editing service to the region’s industrial and scientific community. Later, as a mature student, Mark took a degree in information and communications technology at Savo Vocational College in Kuopio and gained internationally recognised certification as a systems engineer. During the final ten years of his working life he was a civil servant responsible for network development, administration and support in local government. Working on his book during the winter months in the 1990’s, while his strawberry fields in Finland were deep under snow, and arctic weather kept him indoors, "Blades of Grass: The Story of George Aylwin Hogg" took shape but then life got in the way, priorities shifted and the manuscript lay dormant for some years. In the meantime, the film “The Children of Huang Shi”, produced out of Hollywood and directed by Roger Spottiswoode, came out in 2008. This was based on a screenplay written by James MacManus who, in his research, was given free access to George Hogg’s archive. Nevertheless, the story depicted in the film left a lot to be desired as far as historical accuracy was concerned - a fact acknowledged by MacManus himself. This prompted Mark to get his book out in order to present the true and full story and attempt to explain how his uncle, George Aylwin Hogg, became the truly remarkable person that he most certainly was. Mark was particularly impressed by the fact that President Xi Jinping, during his State Visit to the UK in October 2015, mentioned George Hogg by name in an important speech as a shining example of the various forms of war-time aid provided by Great Britain, for which China is most grateful. President Xi referred to "Ho-Ke", Hogg’s name in Chinese, 2 minutes 55 seconds into the video. Listen to speech on YouTube here. Consequently, in 2016, in his retirement and living in the south of Finland, in Kirkkonummi, the author managed to finalize his book which was then published on 24 January 2017 by AuthorHouse. And in May 2017 he passed all of George Aylwin Hogg’s papers to the archivists at the renowned Bodleian Library in Oxford for posterity, where they were gratefully received and are now more widely available to researchers. This page has been accessed 14000 + 574 times since January 15th 2018.